New a few ideas for ghetto fabulous tattoos? Learn what "ghetto fabulous" means and check out a few designs. Ghetto fabulous is a slang term used to describe a lifestyle that includes certain luxuries even though some basic needs may go unmet. Sometimes looking rich is the next best thing to having a fat bank account, especially in a struggling economy. Tattoos are an artful way to show off your interests, personality and, in the instance of ghetto fabulous tattoos, your desired economic status. Whether you want to appear as though you're moving up in the world or you simply love the look of these designs, these tat ideas are sure to please. 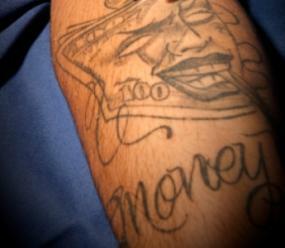 Show me the money: Dollar signs and bills are a sure way to incorporate a money theme into a ghetto inspired tattoo. Whether you opt for a roll of Benjamins or strike it rich with a satchel filled with coins, money tats are a perfect ghetto fab design. For a vanity approach, why not tattoo your own portrait on the center of the bills? Bling: Although sequins, crystals and diamonds can't sparkle on the skin, you can get the look of bling with a dimensional solitaire design. Rather than go with the classic shooting star pattern, opt for a shooting stream of diamonds. Rest in peace: For any fallen brothers or loved ones, a rest in peace tattoo is another popular ghetto fab design. Whether you go with a full shoulder dedicated to your lost one or choose a simple R.I.P. inscribed with the name and birth/death dates, memorial tats are very common and hold special meaning. Song lyrics: Adding a few of your favorite lyrics is the perfect way to honor one of your favorite R&B or rap artists. 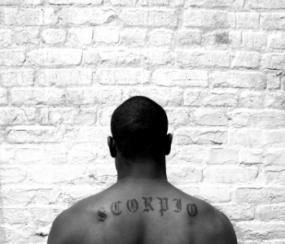 If your name is part of a rap song, you can even make your tat personal by incorporating these lyrics into a name tattoo. Gold links: Can't afford the real deal? A linked chain around your neck or wrist is a permanent and affordable solution to rising gold costs. Prison tattoos: For those that have served some time, a prison tattoo is a likely design that has both history and meaning. Mama: Another popular ghetto fab tattoo idea is one that honors your mother. Consider adding her name to a rose, a portrait with her face or a dagger and an R.I.P. if your mother has passed. Mama tattoos are a perfect tattoo design for both men and women. If you're torn between a tough tat or a sentimental one, this classic style is sure to make your mom proud each and every time. "In the hood" - Show passerbys that you're living it up in the hood. "Show me the money" - That's right! With this attitude, you're all about business. "Da bomb" - You've got the confidence, why not show it? "Bootylicious" - Show off your love of better assets with a booty tat. "Cuttin' the rug" - Got your jive down? A simple phrase like this shows your confident with your dance moves. "Do or die" - Guys from Bedstuy, Brooklyn unite with this slang term. "Down low" - If you're living a fly life incognito, this simple phrase shows the world your lips are sealed. "Old school" - If you represent the streets in the old school way, this tat phrase keeps it real and shows your buddies how far back you go. One thing that makes ghetto style fabulous is the lack of modesty. Rather than stick with a conservative or simple color palette, go wild with bright and royal hues like purple, red and gold. Keep your tattoo fresher and prevent fading by applying sunscreen as needed during the healing process and throughout the life of your tattoo. Keep in mind, size matters when designing a ghetto fab tat. Dinky tats will hardly be noticed, so be sure to place your tattoo in a visible area where there is plenty of skin for an artful canvas. 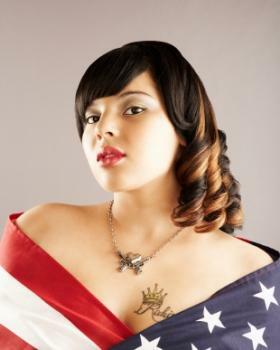 Whether you rock a pair of sketched stilettos with the term "Hot Stepper" or opt for a classic purple low rider with bump in the trunk, there are plenty of tats that will highlight your style and are guaranteed to turn some heads in the hood. For the most bang for your buck, remember to go large or go home!